You are here: Home / Reflective / The Aaron Hernandez Situation – A Failure of Community? But there’s another side of sports culture that I resent – the scandals, the criminal violence, and the actions of selfish people that have deluded themselves (and perhaps others) that the rules of society and civility do not apply to them. To be sure, I loath such things in any scenario, whether it be political, or from the entertainment industry or when it’s a church pastor/ministry scandal. In essence, when we hear stories of those who abuse their power, we as a community feel we have been robbed of something. Had Hernandez somehow been acquitted, I would have been bewildered and angered by yet another case of the double-standard of privilege. But since justice was administered and society received a desired outcome, my humanity remains intact and I can wonder, can we feel any mercy for Hernandez knowing that he will be imprisoned for the rest of his life? Perhaps the first sense of mercy I feel is considering whether any of this could have been avoided. All the classic questions return regarding family upbringing, genetic predisposition, faith and governing ideology that shapes identity and of course, community. I have come to see community as some form of an equalizer more or less. In listening to people’s stories over the years, we find the common observation that we all come from so many different walks of life and somehow our paths intersect at this given point. So much seems to change along the journey of life. Perhaps it’s not completely random, perhaps it’s not as deterministic as we thing. Perhaps discovering community is among the providential mercies we receive. This is not about fore-ordination/pre-destination but more about the beautiful opportunities that are charged with potential goodness. In this way, community can be a corrective or it can be a source of enablement. Of course, it’s more then that but for the sake of this thought, I cannot help but wonder how much Hernandez’s life could have changed had he been shaped by the values of a different community. Less awkward to consider, what are the differences between Aaron and the vast majority of the NFL players who live peacefully and whose lives resemble the ordinary aspects of American life? Thinking a bit darker, what’s the difference between Hernandez’s sense of entitlement and the other players who have a similar disposition of self? We might chuckle and say “guns” but any amount of thought would dismiss that. I think it comes down to what happens to us as we search for our identify and as we are shaped by those around us (i.e., community). Since his Florida University days, it certainly did seem that he thought the rules didn’t apply to him. Again, I assume he was surrounded by people who enabled his selfish entitlement. This continued and apparently mutated even more as he entered the NFL. Just about every celebrity type has at least one foolish friend that says, “Dude, you could do whatever you wanted to do and get away with it.” It’s as if they actually give you this friend when you sign the contract. In any case, inevitably this fool becomes your soul mate, err, I meant cell mate. Months from now we’ll hear that his old college teammate, Tim Tebow went to visit him in Walpole. Michael Vick and Coach Dungy will share that Aaron has become a Christian in prison and ESPN will do a feature interview. And of course, one day you’ll hear in a sermon that even the hardest hearts can become saints because of God’s grace. I know how this cynicism feels to read. And obviously all that would be a better scenario than hearing Hernandez killed two more people while they were attending their Bible study. But to be blunt, I’m weary of it all … and I’m only a spectator. But despite my sarcasm here, I am saddened by all the missed opportunities Hernandez now represents ranging from community to his talent. With his natural ability, years of coaching and training that was invested in him and all the work that he has put in, this is all wasted. I feel sympathy for his daughter, mother and his family (I suppose even for his fiance because of the situation she was in). For most of us, Aaron Hernandez will just go away and society, with the help of the news media, will move on to the next public spectacle and we’ll keep living our own messy, complicated, at times, wonderful and very human lives. But the man who Hernandez killed, Odin Lloyd, will remain dead, his family will remain grieving, and Hernandez family will move from one court case to the next trying to hold on to whatever money is left. We can say a lot of things here – “These are the consequences of such actions!” and “This case shines a spotlight on the awful reality for so many people!” This is all true but I find myself stuck on how we get here so frequently. Not only are there are so many violent cases like Aaron Hernandez but this isn’t his only one! He’ll be on trial for a double-murder later this year. Does Hernandez’s life and the many others, including Odin Lloyd, change if Aaron has better friends holding him accountable and fewer friends enabling him? Does Aaron’s life change if he spends more time with former teammates like Tim Tebow? Do all the old adages regarding friends and how they shape your character and how your friendship shapes the character of those around you? While everyone has to own the consequences of their actions, friendship and community become very significant shapers of life. I find myself thinking about this truth in light of this case. And thus, I find myself wondering do I enable those around me and if so how much? 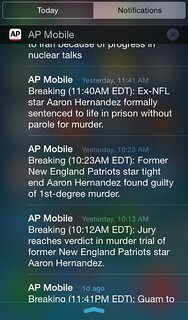 It’s a bit over-dramatic and most likely, I don’t have an “Aaron Hernandez” type amongst my circle of friends. I know, I know, it’s always the person we least expect and so on but I’d prefer to channel my attention to something more probable. What is realistic is that I have those who cause great pain around them and two, and maybe even an Odin Lloyd type that gets sucked in to dysfunctional relationships. What’s also likely is that with the blessing of friendship I can bring, I too can also bring pain, and with this realization, I am humbled by what it means to be a person in community with others. We’re not wired to be heroes saving everyone around us from the many pitfalls found in life but we can faithful sojourners of life. The years have taught me that you cannot actually maintain the same level of friendship with everyone (our thousands of “friends” on social media have reinforced this). But even with our appropriate boundaries and a healthy sense of appropriate relationships, we can share the road together with those whose lives providentially intersect with ours. May God give us eyes to see what’s around us and courage to serve one another. Also on my mind is what the punishment should be for Dzhokhar Tsarnaev. “-“;”-“;*never came to be due to 170 3M tracks being stolen and around 130 +original songs being stolen as well as around 400 original art pieces also stolen , in addition too: countless hours of illegal stingray wiretap survailence steaming DefterRyhme aka name = constructor of omnibox 1.1 ASFS id:RLMIV. the added .sj. $b. was added after earning it when finished with my first omnibox, a 16 rom os compatible monarch vai .all 16 os ios rom kernel arev ce. universal ASFS 80×1 SLiix2 ASPii 8 million px iso vtr cam vtr oricle vgtr citrix cloud etc… all stollen due to doming humans= slavery. im a white male. 47 years old , i do comedy , art, write music , sing rap a little , but really just chill at home fixing my house, while getting totaly abused. my familys vessel log was stolen, as the first settlers of africa (of course not including thde native african tribes) as missionaires my family financed and built the robert leigh mccotd zulu nation hospital in africa(Durban city i believe, in dom its hard sometimes to know what the real data is , everything has been controlled from cellphome home cable and internet all controlled 24 7.) fot the zulu nation tribe.